How can you choose the right tubing or hose for your application the first time and avoid the hassle, frustration, downtime and costs associated with purchasing errors and product returns? In the first part of this article, we discussed tips 1 through 10 tips. We follow up this week with 10 more valuable tips. How soft or hard should your application’s tubing or hose be? Tubing hardness is measured as its durometer, and different scales, namely Shore A, Shore D, and Rockwell R, are commonly used for plastic and rubber materials. The lower the scale number, the softer and more flexible the material will be. For instance, silicone tubing is a very soft, flexible product. A typical hardness rating for it is Shore A50. Polyurethane tubing is not as soft as silicone and can measure between Shore A70 and A95. Harder materials such as nylon and polyethylene are normally measured on the Shore D scale, and actual ratings vary widely due to different material formulations (i.e., high density polyethylene and linear low density polyethylene). Others like polypropylene use the Rockwell R scale. Flexibility and softness – or hardness – requirements differ greatly between applications, so the needs for your particular job must be carefully considered. In general, softer tubing materials are more flexible, and some may be a bit tacky. Harder products normally offer less friction and can easily glide across the surface of other items. Also, the type of fittings that are needed to make connections changes depending on tubing hardness, as does the necessity for clamps. Tubing and hose applications can involve high temperatures or electricity, leading to concerns about fire safety and flammability. How about your application? Do you know what will happen to the tubing or hose if it catches on fire? Might it emit fumes? Self-extinguish? Is it non-flammable? It all depends on the material. Some tubing and hose, such as that made from particular polypropylene formulas, meets burn ratings established by Underwriters Laboratories (UL). Silicone tubing will self-extinguish, and fluoropolymer is non-flammable. Certain silicone and fluoropolymer formulations can withstand temperatures as high as 500°F (260°C) and are frequently used in electrically-associated applications like computers and appliances. But other tubing can release hazardous chemicals when burned. An example is the high-performance synthetic rubber, Viton®. Be sure to consider the likelihood of fire or burning when selecting tubing or hose for your particular application. If your supplier is unable to provide flammability data, evaluate the choices carefully and consider testing the product. Will your application’s tubing or hose transfer critical fluids? Is there reason for you to be concerned with the environmental conditions under which the tubing or hose is manufactured? Or is the application a simple drainage tube that needs to transfer condensation from point A to point B? Applications vary greatly, and the highest quality product available is not always necessary. When the application involves high purity (vaccine manufacture, for example), standards from organizations such as the FDA (Food and Drug Association) and USP (United States Pharmacopoeia) may dictate which tubing and hose materials can be used. Factors such as leachables (chemicals or additives that can migrate out of the tubing or hose), material and product curing processes, and traceability may be vital. Research the products under consideration and ensure they meet the required standards. When the application’s not so critical, you may be able to save money by using tubing or hose that doesn’t meet stringent requirements. Relatively inexpensive products like unreinforced PVC or polyurethane tubing perform well in many applications. Be sure to consider products discontinued by a manufacturer, too. They may be acceptable for your application and available at a reduced cost. Does your application involve water, condensation, or humidity? Tubing and hose materials react to moisture in different ways. Some materials absorb water and other liquids, and that may be unacceptable. Absorption (the penetration into the mass of one substance by another) can cause the tubing to swell, so if the application involves dispensing measured amounts of a fluid, you may actually be getting less than the desired amount. Swelling can affect physical properties such as elasticity and tensile strength. Tubing that absorbs fluids can leach those fluids back into the stream and cause contamination in critical applications. Problems with fitting connections can occur, too, and applications involving a tight fit may be jeopardized. Materials such as PVC and fluoropolymer have smooth, slick surfaces, leaving less opportunity for fluid adsorption (the process by which molecules of a substance, such as a gas or a liquid, collect on the surface of another substance, such as a solid; the molecules are attracted to the surface but do not enter the solid’s minute spaces as in absorption). Other materials like ether-based polyurethane resist attack from moisture and inhibit mold growth. Be sure to check tubing and hose descriptions for information regarding moisture absorption when you believe it could affect your application’s performance. What will travel through the tubing or reinforced hose used in your application? The ingredients of the substance, be it a gas, fluid, powder, or granular material, must be compatible with the tubing or hose you plan to use. An adverse reaction between tubing and the material flowing within it could be disastrous. You don’t want a situation where, for instance, an acidic fluid eats its way through the wall of the tubing. Several tubing materials (PVC, fluoropolymers, Viton®) offer a high degree of chemical resistance and can be used in a wide variety of applications. Others are better suited for simple air transfer or water drains. The ingredients of the tubing or hose can also have an effect on the materials flowing within. Sometimes chemical compounds used in their manufacture can leach out or react with substances. Certain tubing materials like polyurethane are less likely to leach ingredients. Don’t forget about other fluids and gases with which the tubing or hose may come in contact. Consider cleaning products that may be used on the exterior or gases that may exist in the same room as the tubing or hose. The chemicals may seem harmless enough, but their effects on particular tubing and hose materials should be investigated. When you’re unsure about ingredients being well suited to each other, consult chemical compatibility charts, ask colleagues, and question suppliers to be sure the tubing/hose and the material it will carry will work well together. If your application involves the movement of tubing or hose against other equipment, you’ll need to make sure that both the tubing and the equipment can withstand any abrasion. You’ll want to avoid a situation where motion or vibration causes friction between tubing and equipment. But when that’s not possible, the tubing material selected must be abrasion resistant. Certain materials like polyurethane and nylon handle abrasion better than others. The materials’ properties allow them to naturally withstand repetitive scraping or rubbing. Other materials – silicone, for example – are better suited to applications that do not involve abrasive environments, although options like jacketing and special formulations can make materials acceptable. Corrosion resistance is another item to consider. Is the liquid in your application acidic? It will need to flow through tubing or hose that can withstand such a chemical formula. PVC is known for its corrosion resistance, as are fluoropolymers like PTFE, FEP, and PFA. Consider, too, the environment the tubing or hose will be in and whether corrosive fluids will come into contact with the tubing or hose. Will anything drip down onto the tubing? Splash up? Might a lubricant used on other parts of the equipment (i.e. metal) affect the tubing? Do not assume you’re aware of every tubing and hose material available. Research each need individually to make sure you’re not over- or under-engineering your application. Advances in plastic and rubber development occur frequently, and you should keep yourself informed. Some plastic materials have similar properties and can be substituted for each other, depending on the application. For instance, polypropylene and fluoropolymer tubing often have comparable performance characteristics such as their tensile strength, excellent chemical resistance, and outstanding electrical properties. Polypropylene doesn’t have fluoropolymer’s wide temperature range, but it can often serve as a less-costly replacement. Coextrusions – tubing with one material on the interior that’s permanently bonded to another on the exterior during the manufacturing process – are another option. When an application requires different performance characteristics for the inside and outside of tubing, coextrusions can often save costs. Another example of coextruded tubing is polyethylene-lined EVA (ethylene vinyl acetate). 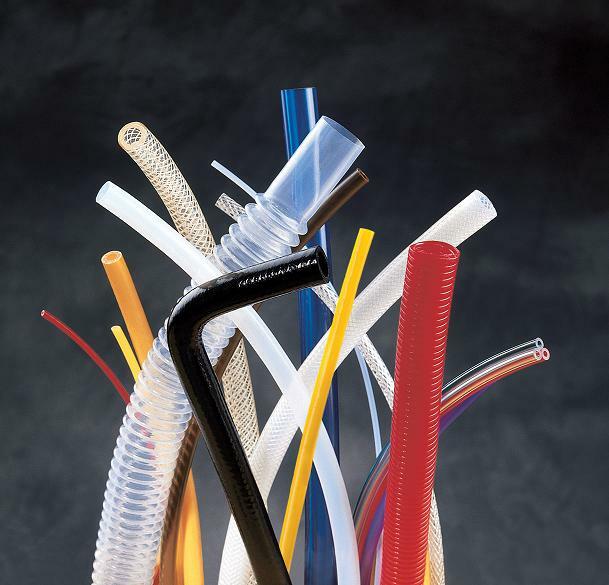 Polyethylene tubing is typically a semi-rigid product. The addition of EVA enhances its flexibility and allows its use with economical barb-style fittings. Like Hytrel-lined PVC, this tubing offers different performance characteristics for the inside and outside of the tube – cleanliness inside, flexibility outside. Keeping alternate tubing materials in mind or researching them for a project, whether it’s a new one or a retrofit situation, can help hold down costs. Using a material that does more than you need isn’t always the best choice. Does your application involve the use of tubing or hose inside a facility or out of doors? Conditions can vary greatly in either environment, but indoor usage normally offers more predictable surroundings. Temperature and humidity can be monitored and maintained indoors. Ventilation, whether it’s automatically operated or controlled by fans that are turned on manually, can be regulated. Lighting is manageable. Outdoor usage can have particular requirements. The tubing or hose may need to resist temperatures that vary from well below freezing to over 100°F or higher. It may need to handle the effects of rain, wind, and gases like ozone. And regardless of the effects of weather, the tubing’s flexibility should remain predictable. Sun exposure is another important consideration. Sunlight and its heat can alter some tubing and hose materials by hardening or discoloring them. Certain materials (polyurethane, for example) and/or colors (black) handle the effects of sunlight and ultraviolet rays better than others. Consider the whole environment in which your tubing or hose will operate when choosing the best product for each application, whether it’s indoors or outdoors. Don’t settle for stock products if they don’t fulfill your requirement – ask about customization. Can the tubing be made in a different size? Can it be tinted to match your company’s identifying colors? Can it be made in a different hardness (durometer)? Can it be molded to fit around a particular design element? Can you get it with fittings and clamps already attached? Can you get 8,000 pieces, each a foot long, with a 4″ slit at one end? Some companies are able (or willing) to sell only full coils of tubing or reinforced hose and offer no alternatives. But you may not know if you don’t ask. Customization can be as simple as a different I.D. (inner diameter) or as complex as color-matched tubing with a static dissipative additive that’s printed with temperature limitations and formed into 10 foot retractable coils with a diameter of 5″. Be sure to explore your options when an application calls for a non-stock item. Examples of customized tubing and hose include performance additives, different colors and sizes, in-line cutting, thermal bonding, heat-formed shapes, coiling, printing, overbraiding, and hose assemblies. Keep in mind that minimum quantities and lead times are likely with custom products. In most cases you’ll need to attach your tubing or hose to other equipment. Fittings and clamps come in many different materials – from nylon to PVDF, fluoropolymer to brass – so you can select the best match for your application. You can even build an entire system from one material (polypropylene, nylon, polyethylene, fluoropolymer), which can greatly simplify the upfront work of checking for chemical compatibility. When using different tubing and fitting materials, remember that the two materials must be suited to each other and must both work well in your application. Pressure and temperature also need to be considered. In general, softer tubing like PVC, polyurethane, and silicone work best with barb style fittings. Barbed fittings are inserted into the tubing, which stretches to grip the barbs and form a seal. They are available in plastic or metal in a variety of styles and may be used repeatedly or for single uses. Clamps are typically needed when barbed fittings are used, and they, too, come in various styles and materials. Some can be applied by hand, while others require the use of screw drivers or hand tools. Harder tubing materials such as polyethylene, polypropylene, and nylon are better suited to push-to-connect and compression fittings. Unlike barbed fittings, these types grip the exterior of the tubing. O-rings and/or the fitting’s surfaces seal the tubing ends for leak-free connections. In the case of a hose assembly with a permanently-attached, stainless steel barbed fitting, a collar is typically used. The collar acts like a clamp by putting pressure on the hose, sealing it to the fitting on the hose’s interior. The attachment is done by trained personnel using special equipment. Your fitting and clamp choices will be determined primarily by your application, but be sure to do the research needed to determine which material and style will work best. Click here for the first part of this article – Tips 1-10. It can be challenging to make sure that you have covered all the bases during the tubing and hose selection process. Have you considered all the elements involved with the application? Temperatures, chemicals, pressures, flexibility needs? Have you ever ordered hundreds, even thousands, of feet of plastic tubing or reinforced hose and then found it wasn’t the best product for your application? This article on Top 20 Tubing & Hose Buying Tips can help avoid the downtime, costs, and frustration involved with ordering the wrong tubing or hose. The tips highlight details that can be overlooked, present questions to ask your supplier, and suggest research you can do to help avoid buying errors. In this first part, we present Tips 1 through 10; check back next week for tips 11 through 20. You may need to know if the tubing or hose under consideration is manufactured with FDA (Food and Drug Administration), NSF (National Sanitation Foundation), USP Class VI (United States Pharmacopoeia), 3-A (a dairy industry organization), or other association-approved ingredients. If this is the case, check the supplier’s tubing specifications for this information. If you’re unsure whether the application calls for association-approved ingredients, find out from an informed source, such as the end user or product design engineer. Educate yourself about required ingredient approvals to avoid the hassle of buying something you may need to return. Applications can range from simple drainage lines, well handled by gravity and involving virtually no pressure, to those requiring a robust product able to manage full vacuum (29.9 in/Hg). You’ll need to consider whether your application is one of these extremes or, more likely, one that falls in between. Some unreinforced tubing can deal adequately with low pressure situations; others cannot. It often depends on the tubing material and how hard or soft it is (i.e., polypropylene or latex). Reinforced hose is frequently called for in pressure and vacuum applications. In fact depending on the type of reinforcement (braid, fabric, stainless steel wire, convolutions), certain types of reinforced hose are well suited for pressure applications, while others are better for vacuum. If you’re unsure of your application’s pressure or vacuum needs, you’ll need to ask questions, conduct tests, or find out from an informed source. Research the needs and usage to avoid situations where the tubing or hose ruptures – or even explodes – because it was not the right product for the application. Human injuries can occur depending on the severity of the rupture. Several things need to be investigated when it comes to tubing, hose, and temperatures. Can the tubing or hose being withstand the temperature of the product traveling through it? Is that product a liquid, gas, dry material, or electrical wiring? Also think about the temperature of the environment it is in. Will the tubing be inside a controlled environment that’s kept at a constant 72°F (22°C)? Will it lay next to other equipment that throws off heat? Will the hose or tubing be outside and subject to both heat and cold, plus variable sunlight? Will it need to operate and remain flexible below freezing? Remember, the higher the temperature, the less pressure the tubing or hose can handle. Your application may be well served with, for instance, 1/4” silicone tubing conveying water at 200°F and a working pressure of only 20 psi at 70°F. But if the temperature increases to 300°F, your pressure handling capabilities will decrease. Reinforced silicone hose should then be considered. Flexibility is a property that varies greatly depending on the type of plastic or rubber material and its construction. Factors that affect flexibility include durometer (softness or hardness), force-to-bend, size, wall thickness, reinforcement style, and temperature. Some plastic tubing and hose, like that made from softer-durometer PVC or polyurethane, is very flexible. Most rubber tubing such as silicone and latex is also flexible. Examples of harder durometer flexible plastic tubing include those made from nylon, fluoropolymers like PTFE, polyethylene, and polypropylene. These are fairly stiff in their common straight tubing styles but are bendable. Customization such as coiling, convoluting, and corrugating can make them more flexible. Closely related to flexibility concerns is kink resistance. If your application calls for the tubing or hose to bend around machinery, its resistance to kinking and collapsing upon itself must be considered. Sometimes a very flexible material – silicone, for instance – can address the issue. But if pressure and/or durability requirements will not allow the use of such a soft material, the hose’s construction can come into play. Braid or wire reinforcement can help to reduce the occurrence of kinking, as can products that are multi-layered. Stiff materials can also resist kinking provided that enough length is incorporated into the design. The weight of a tube or hose can have a big impact on a final product. You need a product that will help keep overall equipment weight at a minimum but one that can handle the job. Tubing material, size, wall thickness, and reinforcement (if any) affect its heaviness. For example, a typical 100 ft. coil of unreinforced polyurethane tubing, 1″ I.D. x 1-1/4″ O.D., weighs about 21 lbs. A similar size and length of reinforced PVC tubing weighs 35 percent more. Multi-layered hoses – especially those incorporating metal reinforcement – can be quite heavy. Add metal fittings and clamps to form an assembly, and that increases the weight further. The overall weight of the tubing, reinforced hose, and/or assembly components used in your application must be examined. You’ll want to make sure you don’t create a situation where a hose assembly’s weight pulls on other components such as fitting connections. If your application involves a bulkhead, you don’t want the assembly putting a strain on the entire system or structure. If your application involves foods, beverages or dairy products, any taste or odor transferred to those products could be critical. Some tubing and hose materials contain plasticizers (chemical agents) to facilitate processing and aid in the flexibility of the finished tubing or hose. Under certain circumstances these additives can leach out from the tubing or hose. They can appear in the streams conveyed by the tubing or hose or possibly affect the stream with a taste or odor. That may be fine if the line is used for drainage or a waste product, but if the fluid is part of a finished product that someone will consume, taste and odor transfer is a significant concern. Certain tubing and hose materials (silicone and polyurethane, for instance) are naturally flexible. There are no plasticizers used in their manufacture, so the potential of taste and odor issues that can come from the use of plasticizers is eliminated. In any case, if taste or odor is a concern in your application, you should sample a candidate hose or tubing to test if the material might affect your stream. Do you need to see the flow of product through the tubing or hose to check for consistency, progression, or to note measurements? Perhaps the nature of the application makes it undesirable to see what’s inside, so an opaque color is called for. Do not assume that because one style of a particular hose material is crystal clear that all hose of that material is the same. The hose’s construction, whether it’s reinforced with wire, braid, or spirals, can greatly affect its clarity. Several tubing products are available in clear styles – PVC, polyurethane, and some fluoropolymers are examples. But when they’re in the form of reinforced hose, their clarity can be compromised. Many tubing materials can be tinted or colored to varying degrees of clarity. Clear or color-tinted transparent tubing allows light to pass through so that objects within or behind can be easily seen. Some tubing materials (silicone, polypropylene, latex) offer translucency and allow light to pass through but not detailed images. Plastic tubing is often considered a disposable item, but it doesn’t always have to be. Learning whether the tubing or hose for your application can be cleaned and used again can save you money. Discover whether the tubing or hose can handle one or more standard cleaning methods. Other important information to know is how many cycles, or how many times, it may be cleaned using the same procedure. Testing for your specific application is best. Research the best cleaning method for the type of tubing material you have in mind. Can it be autoclaved? Low-pressure steam sterilized? Gamma irradiated? Cleaned with a specific chemical? Does the application call for a simple flush cleaning with water? Some plastic tubing materials such as polyurethane and PVC are quite durable and chemical resistant. Other materials may handle high temperatures well but not certain cleaning fluids or gases. Depending on the tubing material and cleaning method used, tubing may become brittle or gummy, break down chemically, loose its shape, or absorb the cleaning agent. Consider, too, that depending on the labor, equipment, and resources involved with cleaning or sterilizing the tubing or hose, it may be more efficient to replace it. Many people naturally think of plastic as having a smooth surface. The plastic products we use regularly (computers, toothbrushes, phones, pens, cars, items from your kitchen) often have smooth, even glossy, surfaces. In some cases the surface is textured for aesthetic or gripping purposes. What type of surface does the tubing or hose in your application need? Whether your tubing will carry fluid, air, or a granular or powdery substance, you’ll likely want a smooth interior for the most efficient transfer. An irregular surface can cause resistance and slow the rate of flow. Some thermoplastic tubing materials – PVC, for example – offer a very smooth surface (a low coefficient of friction). Others like fluoropolymer and polyethylene are even smoother and feel almost slippery. Polyurethane and certain thermoset rubbers such as silicone can feel tacky, and that might be a desired characteristic in particular applications. What about the exterior? Should it, too, be smooth, or does it need a surface texture like ribbing to make it easier to grip and hold on to? Some tubing styles, specifically stainless steel overbraided types, can be supplied with a protective outer layer of silicone to make the product easier to handle at high temperatures and to eliminate entrapment issues. Other styles are coextrusions where one material is used for the inside and another for the outside. For instance, Hytrel®-lined PVC can be useful in a harsh environment application involving the transfer of oil. The durability of PVC works well for the exterior, while the oil resistance properties of Hytrel are a good fit for the interior. Surface properties can also affect electrical conductivity and static dissipation. Are 100-foot coils of tubing or hose acceptable? Do you need 10,000 straight pieces, each five feet long? Must they be bagged, double bagged for extra cleanliness, boxed, or are stacked coils on a wooden pallet satisfactory? Can lengths of rigid products be cut and boxed to meet requirements for shipping by UPS or a similar carrier, instead of forcing a truck shipment? Knowing how the tubing or reinforced hose will be used can help determine your packaging needs. If it’s going to be inventoried, you may want a protective covering like a bag or box. If the tubing will be used immediately, that may be unnecessary. Ask about bulk packaging (multiple coils or lengths in one box), and see if it will save you money. Perhaps the tubing is part of a kit that you assemble. You’d like six-foot lengths of 1/8″ I.D. clear, unreinforced PVC coiled into 4″ diameter circles, and then placed in individual bags and sealed. Order it that way, so you don’t need to do anything with it other than place each bag with your kit. Do you want the tubing bagged and labeled with your part number, your customer’s, or other useful information such as temperature limitations? Will the tubing be used in a medical, pharmaceutical, or other clean application? Check into having it gamma irradiated before it ships to you, so it’s ready for use upon delivery. Consider the tubing’s application and how the proper packaging can assist the end user. Keep in mind that special packaging is a custom process that will likely involve minimum order quantities, additional lead time, and added costs. For more information, check back next week for Tips 11-20.